Tis the season for Android updates, and Android Wear isn't getting left out of the fun. A new report is suggesting that the Android Lollipop update could be coming to Android smartwatches as soon as tomorrow. The update isn't expected to be as big a change as it was for smartphones and tablets to go from KitKat to Lollipop, but there are some nice new features expected. The news comes from Phandroid, which appears to have an inside source on the matter. The news is that the update will come as Android 5.0.1, and will include the updates that we had heard about in a previous leak. This would mean a number of improvements to make Android Wear easier to use, like easier access to battery and storage info, an option to restore dismissed cards, quick screen brightness toggles (regular, theater mode and sunlight mode), options for the visually impaired, and the actions menu will be reordered based on usage. 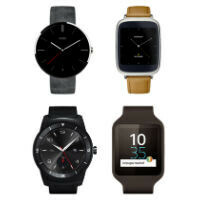 There is also a new rumor that the update could "drastically improve battery life" for some Android Wear watches. And, it will probably become a running theme with Android Wear that each update will end up bringing new watch faces to various devices. Unfortunately, there's no word on the official watch face API, so it sounds like we might have to keep going with FaceRepo. I've been hesitating to pick up an Android Wear watch because I feel like it would be more of a novelty rather than something that is actually useful. Hopefully the 5.0 update adds some great features that will change my mind. Don't forget you can control your Chromecast as well using an Android Wear watch. For that matter you can control the camera on your smart phone using your Android Wear device. With the last update you can even install music right on the Android Wear smart watches. In order to listen to the music from your AW device, you need to pair it to either a Bluetooth speaker or headset. I even play space invaders or Doom on my Android Wear. I was hesitant at first as well but I could not pass a deal on a brand new LG G watch for $79 and $50 Google play store credit from Bestbuy 2 weeks ago. So far I love the watch because I spend less time whipping out my Note 4. And I was really surprised to see that people liked it when I went to work the following day. I didn't think it would turn heads. And battery life hasn't been a concern as long as I take it off before going to bed. I still consider this first gen but I trust that Google will not let it fail. I just recommend searching for a good deal because if you look hard you will find one. I personally wouldn't pay over $100 for any of these first gen devices but I'm really cheap. If the same deal was to repeat today I would do it again. Android wear on my Moto 360 looks pretty much like lollipop already. I am guessing the update won't change the design too much but just add more features maybe. How's the battery life on that throughout the day? It's been a non-issue. I always take my watch off before bed and place it into the charger. No matter how much I use it I always have about 30% left at the end of the day. And this is with the screen on at all times. Even if these watches have a 7 day battery life I would still take it off to allow my skin to breathe. It would bother me to have a watch on while sleeping.